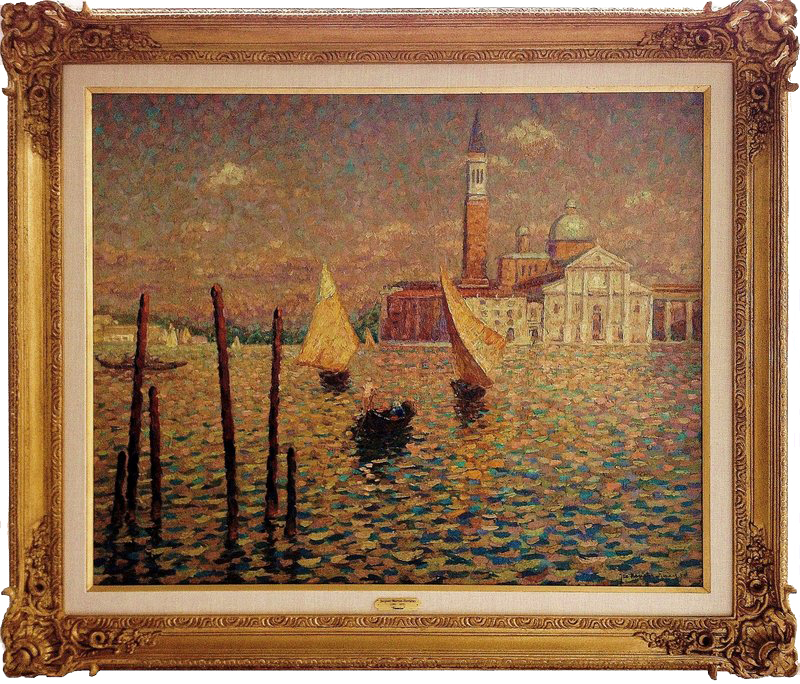 “Venise” Oil on canvas 32" x 39.5"
Jacques Martin-Ferrières was born on August 6, 1893 in Saint-Paul, France. He studied under the French academic painter Frederic Cormon (1845-1924) and with his father, the notable French Post-Impressionist Painter Henri Martin (1860-1943). He was most widely known for his landscape paintings and his brilliant still-life paintings. Although Jac Martin-Ferrieres sought an independent artistic identity, he never ventured far from the precedents set by his father, Henri Martin (1860-1943), or from the shelter of official endorsement. A student of his father, and of a family friend called Ernest Laurent, Jac adopted a modified pointillist technique in his earliest paintings.In the 1920 Paris Salon he received an Honorable Mention, and in 1923 in the same Salon his painting Le Christ was awarded the Silver Medal, and afterward was purchased by the French State. In 1924, Le Boeuf, won him a traveling grant which enabled him to discover Italy. In 1925 he was awarded the Prix National for his important composition Le Peintre. In 1928 his remarkable Marche d’Assissi was awarded both the Gold Medal of the Paris Salon and the Prix Legay-Lebrun and was then purchased by the City of Paris. In 1937 he won the Gold Medal at the Exposition Universelle, and in 1939 he had a large retrospective exhibition in Paris consisting of more than one hundred and fifty canvases. In addition to the honors and awards received in the Salons, Martin-Ferrières was honored by his country. He was made an Officer of the Legion of Honor in 1956, having previously been named a Chevalier of the Legion in 1937. Jac Martin-Ferrieres museum collections include Louvre, Paris, Tate Gallery, London, Museum of Modern Art, New York, Art Institute of Chicago, Fine Arts Museum, San Francisco, Courtauld Institute (UK) Fitswilliam Museum, University of Cambridge (UK) Ashmolean Museum, University of Oxford (UK).